The brother of former Malawi leader Bingu wa Mutharika and 11 other high-profile figures have been charged with treason for allegedly trying to prevent Joyce Banda succeeding him. Former Foreign Minister Peter Mutharika asked the military to take over after his brother's death, an official report said last week. 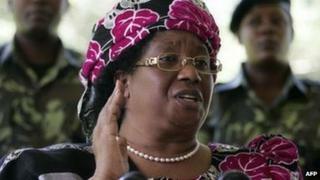 He is accused of seeking to block Vice-President Banda taking over, as required by the constitution. Those charged have not entered pleas. Since becoming president, Ms Banda has reversed several policies. She has devalued the currency - one of several moves demanded by Western donors who fell out with Mr Mutharika. The news of the arrests on Monday sparked trouble, with hundreds of protesters clashing with riot police. Several current and former ministers were among the 12 people charged. Former presidential legal adviser Allan Ntata was charged in absentia, as he is believed to be in the UK. The BBC's Raphael Tenthani in Blantyre says that two of those charged, including government minister Goodall Gondwe, were not in the magistrate's court to hear the charges as they are in hospital after collapsing in police cells. Because treason is a capital offence, the case will be moved to the High Court, where the accused will be asked to enter pleas on Thursday, our reporter says. There was a heavy police presence outside court, where hundreds of supporters of the former ruling Democratic Progressive Party (DPP) gathered, but, unlike on Monday, there was no violence, he says. Peter Mutharika is the DPP presidential candidate in elections due next year. Although Ms Banda was elected as Bingu wa Mutharika's running mate, the pair had fallen out long before he died of a heart attack last April, after it became apparent that he wanted his brother to succeed him. The official report said that army commander Gen Henry Odillo had refused Peter Mutharika's request to seize power.